Other people have jewellery, furniture, paintings, houses even – what do we have? And, a photo of the jugs. 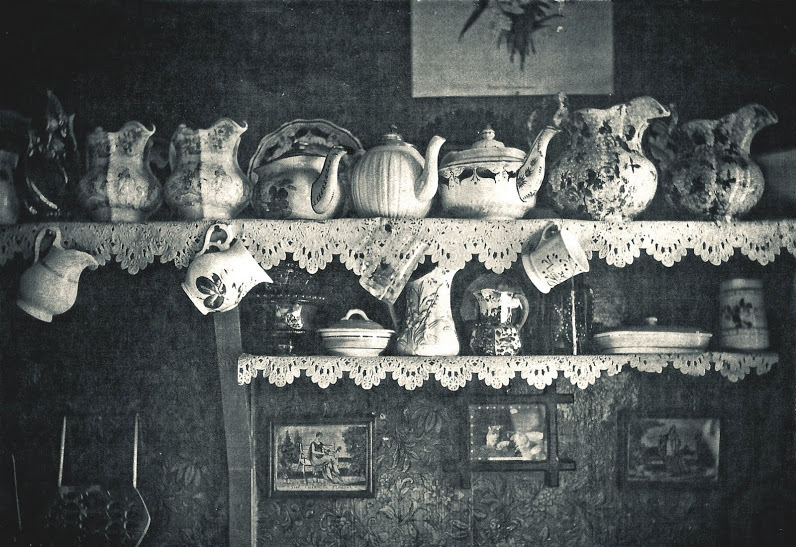 This was taken in my great grandmother’s kitchen about 100 years ago. The two large flowery jugs at top right are mostly green with small pink flowers, my Mam has one of them, and also the one at the right end of the second shelf which is styled like a barrel. The others tend to be various shades of brown and gold – I recognise a few of them as still being in the family. I seem to remember that photographs were quite expensive to process in those days so I’m quite impressed that someone saw fit to take this image – Instagram before its time, perhaps?